How Many Border Patrol Agents fit in a VW Bug? How do I know? Let me tell you! If you drive about 50 miles East of El Paso, on I10, there is a Border Patrol Inspection Station. They used to be open now and then, but with all the border trouble recently and immigration uproar, they are now open 24/7 to stop and check semi-trucks in lane two and cars in lane one. When we arrived there was a bit of a line so the hubby started messing around with his iPhone. We started joking around about how we’d breeze right through since you can’t fit anyone else in my new-to-me Bug. We felt sorry for the van in front of us that we thought for sure would be pulled over and searched. Then we saw a big, drug-sniffing dog with a huge chain, choke-collar around its neck circling the cars. “Ahhh, isn’t he cute!” I thought. I’m surprised we didn’t know his name by the time this little adventure was over. Wha? “Ok, sure, no problem,” I said, still thinking this was just a random check. I pull over and park the car and look over my shoulder in time to see four or five Border Patrol Agents moving purposefully to surround the car. I toss my keys on the dash which happens to have a twenty year old kubaton for a key chain that a friend gave me and I could feel the Border Patrol Agent tense when he saw it. Wait, what?! Our word isn’t good enough? As they walk us into the office. I almost get run over by a car hurrying to get away from them. When we enter the building they sit me down on a long, green bench with handcuffs on chains that trail down to the floor. They take the poor hubby around the corner and frisk him. A Border Patrol Agent asks if I have anything in my pockets. I reach for them thinking I left money in them and he visibly tenses and asks, “Can you pull out your pockets, please.” I pull them out to show him. They take our Drivers Licenses’ and grill us a bit, but the one they’re really interested in is the hubby. I give him an incredulous look. You’re blaming me for this? “No, it ruins the flavor.” They didn’t think that was funny. Hubby corrected himself. “No sir, I’ve never done drugs.” They like it when you call them sir. They take everything out of the car, put it all back in, take it all out, put it all back in… about five times with the dog barking it’s head off all the while. We see the dog dive into the car and fill up the entire front seat. They kept several agents around us. You’d think we were on the FBI’s most wanted list. “You know the only reason a dog is alerted to a car is to identify illegals or drugs,” a Border Patrol Agent informed us with a very serious expression on his face. That earned him a laugh from the Border Patrol Agent. “No, not illegals but they identify unseen people in the car.” He went on to explain if the dog smells a person but can’t see them, then he’s ‘alerted’. The boss tried to grill us, real tough like, which might have fazed us if we actually had anything illegal in the car. They quizzed us about where we were from, why we moved to El Paso and why we were going to Brady, the dead center of Texas. They pulled a white truck up next to our VW bug. This information did not clear things up like I hoped. “Both of us,” I say. “No, I’m the only one that drives the car,” I am pretty adamant which surprises the agent. We still sat there for a while before the dog handler came in, soaked in sweat and explained, “I’m the dog handler and I understand you’ve only owned the car for a month…” He repeated what the other agents told us and then they gave us back our IDs, walked us out to the car and sent us on our way. They trashed the car going through all our bags multiple times and the Agents who escorted us out had the decency to look a little embarrassed. The hubby wanted to put everything back in order there, but I wanted to put some distance between us and them. We stopped about forty miles down the road at Van Horn to fix the damage and grab something to drink. The rest of the trip to Brady was uneventful and Brady itself was wonderful, but that’s another story. Coral Russell lives in the southwest with her hubby, baby Godzilla sized kid and an adorable dog with which she shares a one-way thermal dynamic relationship. She blogs off and on at alchemyofscrawl. Along with her brain buddy, Donna, she volunteers at The Indie Exchange, a group of authors, readers, and book bloggers who post reviews, articles, and giveaways. Listen in Fridays to their radio show. Ms. Russell won the 2003 McCaleb Peace Initiative which produced the non-fiction articles Peace on the Peninsula. All profit from the sale of that eBook go to rebuilding Joplin, MO. 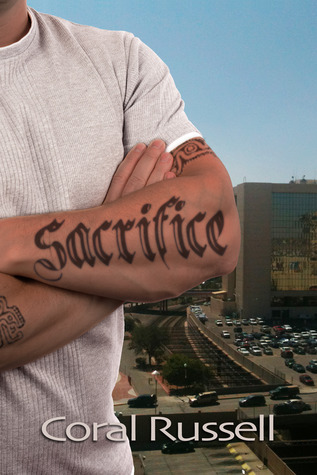 Win ebook copies of Sacrifice , Amazon gift cards or a Kindle Fire. Enter using the Rafflecopter form on any stop from the tour. Giveaway open worldwide until March 31.